Forget tracking your miles per gallon. A new tax proposal in the works could have Bay Area drivers counting their pennies per mile. The Bay Area is considering a long-range plan that would tax drivers for every mile traveled, whether they're on freeways or city streets. The tax would be the first of its kind in the nation, and could cost drivers an average of up to $1,300 per year. The Metropolitan Transportation Commission is behind the so-called proposed VMT (vehicle miles traveled) tax. While the plans are still far from concrete, the early idea would require drivers to install some sort of GPS device in their cars to track the number of miles driven. Drivers would be charged as much as 10 cents or as little as a fraction of a penny per mile. depending on the time of day. Peak travel hours would be more expensive than times when the road. Bay Area drivers commute about 150 million miles every weekday. 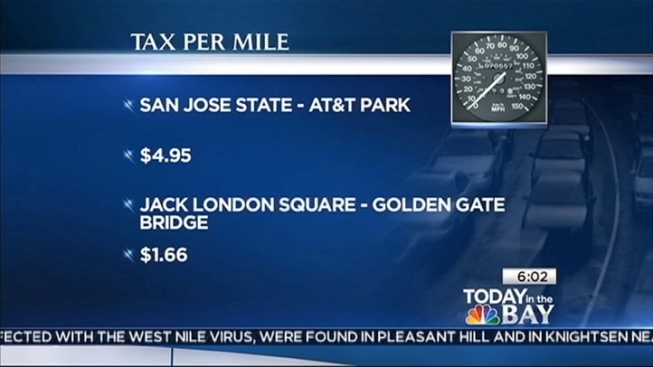 At a cost of 10 cents per mile, the VMT tax could generate $15 million per day. On Wednesday, some drivers didn't seem too thrilled with the plan. "You're kidding!" said Michael Evans of Rodeo. "It's bad enough as it is, with gas prices and the wear and tear on cars." Mountain View resident Matt Taylor says he already has to pay close attention to gas prices. "Any additional money would just make me mad." MTC spokesman Randy Rentschler tells the Mercury News, he knows the VMT tax would be a tough sell for commuters, but argues the goal is to reduce traffic and encourage more use of public transit. In addition, having a VMT tax would raise much-needed revenue for street maintenance and public transit improvements. Members of the Metropolitan Transportation Commission from the nine Bay Area counties are set to authorize a study of the proposal on Thursday. If approved, officials would likely need the blessing of voters and the legislature.